Every indie game studio has the same problem: how to make enough money to make the next game. It seems every month there’s a new post somewhere about how indie game studios are doomed. This is – and isn’t – one of those posts. Sure, it’s hard to make a profitable gaming company in the indie space today, but it was hard in the past too. It can be done! Many people have found ways to make money and games at the same time. Making a profitable game depends on a lot of variables and in the indie space small decisions can add up to big costs. Recently, Tiger Style released a sequel to their successful game Spider. Pocket Gamer interviewed Tiger Style and they looked into the disappointing sales trend that the studio is seeing. It used to be that if you got onto a platform you were guaranteed some returns, now that doesn’t seem to be the case. He refers to the major onset of free-to-play as “the tipping point” for the App Store’s push towards big money, a weighted market in which companies like Tiger Style have no hope of competing. With the premium approach on mobile stores no longer a solid option what can be done? Of course one game does not signify the approach is broken, but it can make people think twice about the strategy. All of this is following the notion that there aren’t any business plans for studios of any size. People are still making it in the indie world despite the obvious challenges of making a game. The strategies have evolved over time and here are some options each served with some scepticism on my part. If you think that you can make a good game and just sit back and collect then you are sorely mistaken. Indeed, just a couple weeks ago Total Biscuit tackled this very concept in a video. It’s worth listening to at the very least. The video looks at Airscape and the creator of the game wrote a very interesting piece on Gamasutra about the release and promotion of the game. If your games are really niche or really artsy then maybe the commercial metric doesn’t work for you. In its 12 year existence Tale of Tales has always teetered on the edge of sustainability, combining art grants and commercial revenue to fund our exploration of video games as an expressive medium. We considered it spreading our dependencies. And that was fine, because we assumed this situation to be stable. All we really wanted was the opportunity to create. They have been fortunate enough to be able to make their games with the support of arts funding. This is not practical for many studios and can be nearly impossible. I know that in Canada you can leverage some arts funding and it’s usually focused on helping individuals – not studios. Last month Tales released their numbers and a bit of introspection on the whole experience since their announcement. They were able to breakeven on the game and are now trying out Patreon to fund their efforts. In 3 months, 17,000 copies of Sunset have changed hands. This includes copies in a Humble bundle and those for the Kickstarter backers. This has allowed us to pay our debts and save our company. Tale of Tales is safe now but we haven’t changed our mind about moving away from commerce. Notice that they reference bundles as something that let them save their company. Grouping indie games into bundles to sell them at a discount all started with the success of the Humble Bundle back in 2010. Now there are so many game bundle sites that I won’t list them all, thankfully. Are bundles worth it? Absolutely. Are they the solution to all your money woes? No. Bundles are part of a large marketing push for your game and if done properly can be successful. There’s a good look into how to effectively use bundles as an indie game dev at Video Game Marketing. 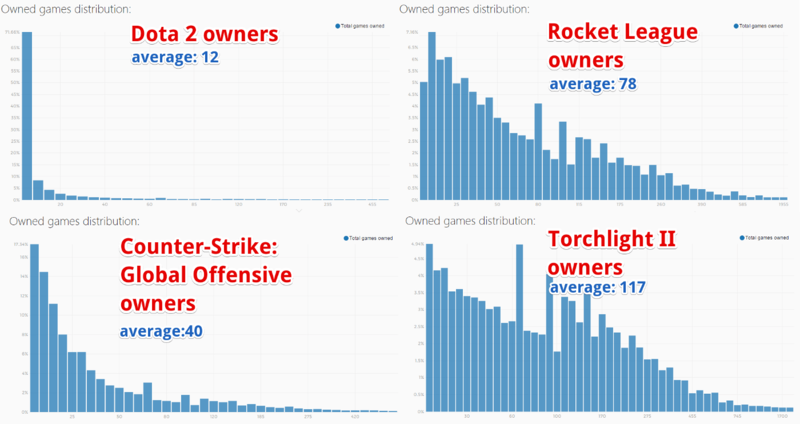 If you look at the decision to distribute your game through a bundle as an isolated event purely analyzed by direct earning potential, you’re going to be scared away. When you understand the “marketing mix” this decision creates and supplements, you likely can’t find a better way to gain attention for your game. Too many people write on the theoretically of important topics, and I refuse to conform – so here’s some practical market data. Maybe you are going to make a game that appeals to a very specific market (like the platform game in the Total Biscuit video). There are problems here too. As pointed out in this excellent article form the people behind Steam Spy, Your target market doesn’t exit. The term “female gamers” includes both a woman in her fifties playing Candy Crush Saga on her phone and a college girl enjoying Call of Duty on her Xbox. They’re so far apart from each other, that it makes no sense to try and fit them into the same vaguely defined category. There are many female gamers, they’re different and there are probably dozens of categories you could divide them in. Ambitions will grow more modest. Budgets will be cut. I’m confident that indie gaming will go on since what’s happening to the games industry has happened to pretty much every field of entertainment. Remember how Napster and GarageBand ruined the music industry and now there is no more music and nobody making money from it? Exactly. Still, if you no longer want to make games you can always try to get paid by playing games. It sounds like you have to find a niche there and rely on direct contributions from viewers.